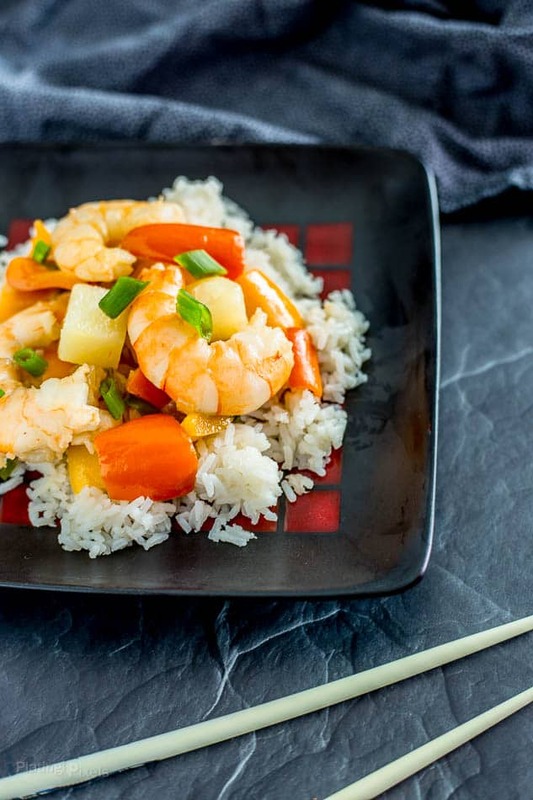 This One Pot Tropical Shrimp Stir Fry is a wholesome meal made with shrimp, onion, bell pepper, pineapple, coconut milk and jasmine rice in a homemade Asian-style sauce. This post is sponsored by Super Lucky Elephant. All content and opinions are mine alone. My recent culinary trip to Belize provided some valuable recipe inspiration. 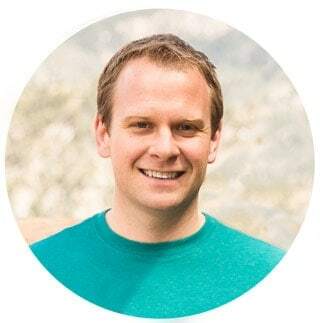 Most of the ingredients such as meats, seafood, vegetables and spices are similar to what you’d find here in the States, but the focus is on simplicity, freshness and quality. Most dishes used minimal ingredients, with each element adding distinct flavors. 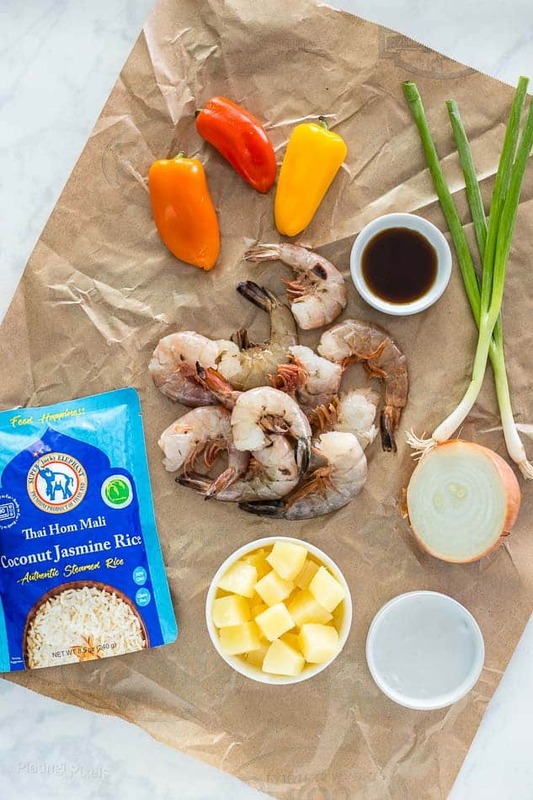 While not a Central American dish, this One Pot Tropical Shrimp Stir Fry with Coconut Rice is definitely inspired by this concept. A common theme there was seafood, and lots of it. We just missed lobster season, but there was plenty of whole grilled and steamed fish, as well as shrimp options available. Many of the menu items featured seafood paired with fresh tropical fruits. One my favorite meals there was fish tacos with a tangy sauce and chopped mango salsa. Life can be busy and hectic, but that doesn’t mean you can’t cook unique meals, even on weeknights. 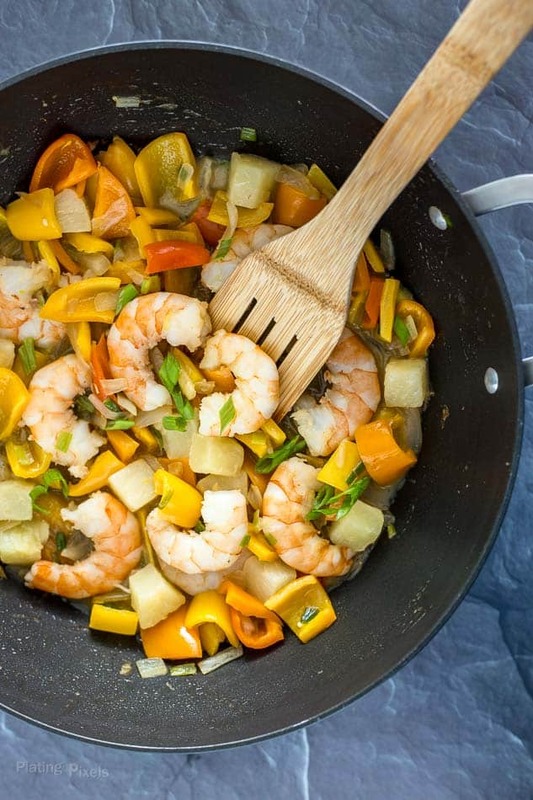 This Tropical Shrimp Stir Fry is cooked in one pot for easy cleanup, and ready in less than 15 minutes, thanks to its simple list of quick cooking ingredients. Onion and bell pepper add wholesome flavor, paired with tender shrimp, sweet pineapple, rich coconut milk, and savory liquid aminos (a gluten-free alternative to soy sauce, which I’ve recently been getting into). To save even more time, I used Super Lucky Elephant Coconut Thai Hom Mali Jasmine Rice. It’s naturally flavored and a tad sweet, without any sugars or sweeteners. This aromatic and perfectly tender rice is authentic, traditional jasmine rice, sourced straight from Thailand. With its purity and quality certified by the Thai government, it is the most prestigious variety of rice in the world. It’s also non-GMO and gluten-free. With little time and effort you can enjoy this One Pot Tropical Shrimp Stir Fry with Coconut Rice anytime. It’s a fun and creative meal full of wholesome ingredients. 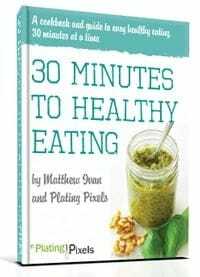 It also works well for leftovers or meal prep, making it a flavorful addition to your easy recipe list. 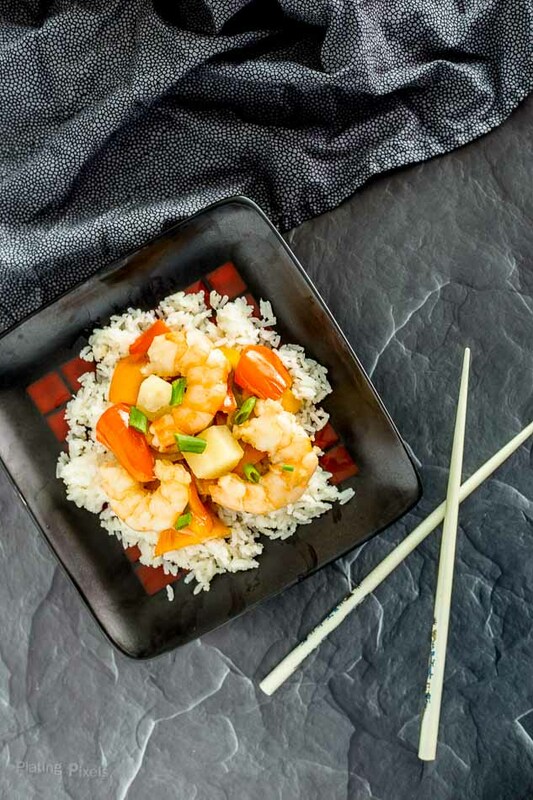 The quick and easy One Pot Tropical Shrimp Stir Fry is made with shrimp, onion, bell pepper, pineapple, coconut milk and rice. Heat coconut oil in large non-stick pan or wok to medium heat. Add onion and cook 3-4 minutes, stirring often, until fragrant. Stir in bell pepper and green onion, cook 4-6 minutes more until tender. Add shrimp and cook 2-3 minutes, or until opaque. Stir in remaining ingredients except for rice. Continue cooking until warm. Remove from heat. Cook rice according to package direction (90 seconds in microwave). Serve with tropical shrimp and vegetable mixture. Perfect dish for the warm weather. Love the colors and the freshness of this dish. Anything that is done in one pot it good with me. That rice sounds amazing. I love the sweet and savory flavors in this! That looks so fresh and delicious! All of my favorite flavors in one dish! I also love how simlple it is!! I love this tropical flavor! So perfect for summer!